Brett Stones, who runs SeaMor Dolphin Watching Boat Trips, said Monday that he was finishing a tour on Friday night when he saw something moving on New Quay beach in Cardigan Bay. Videos posted on SeaMor's Facebook page show the pinkish sea creatures. More than two dozen octopuses were spotted slogging along a shoreline in West Wales, worrying beachgoers, who spent some time picking up the critters and plopping them back into the ocean. Brett Stones, who runs SeaMor Dolphin Watching Boat Trips, said Monday that he was finishing a tour on Friday night when he saw something moving on New Quay beach in Cardigan Bay. When he got closer, he saw that it was an octopus - and that many more were spread across the sand. "It was a bit like an end-of-days scenario," he told BBC News. Stones said that he had never seen anything quite like it. "Seeing something like that out of its environment, you get this sort of feeling of wanting to protect them," he said in a phone interview with The Washington Post. "They won't survive out of the water," he added, explaining that he and others gathered about 25 of the octopuses and put them back into the water to keep them alive. "We collected the ones that were totally out of the water, and plopped them back in at the end of the pier, hopefully saving them from getting stranded. If you're around over the next few evenings, get in touch and we'll let you know where to go," the company wrote in the post. 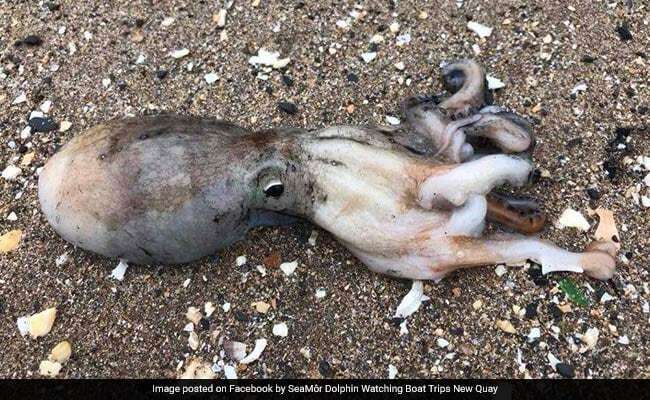 On Saturday morning, the company posted pictures showing several octopuses on land that appeared to be dead, suspecting that they might be dying after spawning. "They spawn in autumn, and some of them die after that. They don't live very long apparently, 1-3 years!!" SeaMor wrote in the comments beneath the Facebook post. Others online reported subsequent sightings. Graham Pierce, a research scientist at Instituto de Investigaciones Marinas in Vigo, Spain, said the beached animals are most likely curled octopuses, or Eledone cirrhosa, which he said are characterized by a single row of suckers along the arms. He said there could be several reasons that they moved on to the beach, including spawning, weather and water temperatures. James Wright, curator at the National Marine Aquarium in the United Kingdom, told the Daily Telegraph and Newsweek that the number of octopuses seen on the same beach at the same time is "quite odd." "But them even being found in the intertidal is not common and suggests there is something wrong with them, I am afraid," he said. "As the areas where they are exhibiting this odd behavior coincides with the two areas hit by the two recent low-pressure depressions and associated storms of Ophelia and Brian, it could be supposed that these have affected them. "It could simply be injuries sustained by the rough weather itself or there could be a sensitivity to a change in atmospheric pressure."